PHNOM PENH, Nov 14 2017 (IPS) - In Laos, the lush forests are alive with the whines of drills that pierce the air. On the Mekong, a giant concrete wall rises slowly above the trees. The Don Sahong dam is a strong symbol, not only for a power-hungry Asia but also for what critics fear is a disaster in the making. 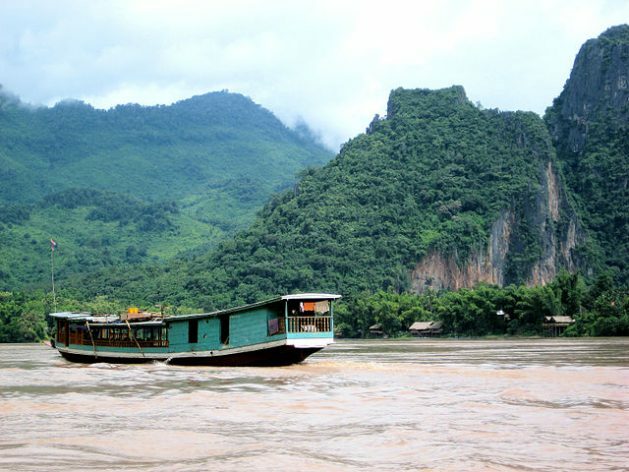 Landlocked Laos wants to become ‘the battery of Southeast Asia’. The mountainous country with swirling rapids has the ideal geography for hydropower production and Don Sahong is just one of nine dams that Laos wants to build on the mainstream Mekong, claiming that this is the only way to develop the poor country. Millions of people in Laos, Cambodia, Thailand and Vietnam could lose the fish they rely on for food. But there are serious drawbacks. The Don Sahong dam is being built with little or no consideration of the impact on ecosystems and communities along the Mekong. According to the Food and Agriculture Organization of the United Nations (FAO), the Mekong is the second most biodiverse river in the world, after the Amazon. It supports the world’s largest freshwater capture fishery. The Lower Mekong Basin provides a wide variety of breeding habitats for over 1,300 species of fish. But damming the Mekong will block fish migration towards these habitats. The FAO calculated that about 85 percent of the Lower Mekong Basin’s population lives in rural areas. Their livelihoods and food security is closely linked to the river and is vulnerable to water-related shocks – not just for fishers but for thousands more who sell food products or provide hundreds of related services, says FAO. Millions of people in Laos, Cambodia, Thailand and Vietnam could lose the fish they rely on for food. Chhith Sam Ath, the Cambodian director of the World Wide Fund (WWF), claimed in The Diplomat that the Don Sahong Dam is “an ecological time bomb”. “It threatens the food security of 60 million people living in Mekong basin,” he said. “The dam will have disastrous impacts on the entire river ecosystem all the way to the delta in Vietnam.” This is particularly devastating for downstream Cambodia because more than 70 percent of the protein consumed there comes from fish. The 260-megawatt dam can also endanger the Irrawaddy dolphins, which are an important source of ecotourism on the Cambodian side of the Mekong. There are only 80 dolphins left. Some live just a few miles from the Don Sahong dam site. WWF warns that damming the Mekong will soon drive all the remaining dolphins to extinction. Laos is going forward with the dam all the same, without approval from the Mekong River Commission and in defiance of protests from NGOs and downstream countries. Lao officials say that they cannot stop the country from pursuing its right to development. They argue that they will address some of the concerns with ‘fish-friendly turbines’ and fish ladders. But critics are not convinced that these measures are sufficient. Downstream, Cambodia is making things much worse. On a Monday morning in September, Prime Minister Hun Sen pushed a symbolic button. For the first time the floodgates of Lower Sesan 2 Dam closed and an artificial lake started to fill. Cambodia now has its own 800-million-dollar battery, built with Chinese funds and knowhow. In the opening ceremony, Hun Sen praised the technological miracle and the Chinese investors. He pointed out that the need for electricity is growing rapidly. Cambodia has the most expensive electricity in Southeast Asia. That will change with this 400-megawatt dam on the river Sesan, close to its confluence with the Mekong. In Kbal Romeas, upstream the Sesan, fishermen waited in vain for the yearly migration in May and June. No more fish to catch. The villagers have moved elsewhere, escaping the rising water and increasing poverty. The only reminder of a once lively Kbal Romeas is the roof of a pagoda that seems to float on the empty water. The American National Academy of Sciences predicts that the fish population in the Lower Mekong Basin will decline by 9.3 percent. That’s just one dam. More dams are on the drawing table. The Mekong River Commission (MRC), the intergovernmental body charged with coordinating the river’s management, recently released provisional but alarming results of their research. The two finished dams and the 11 scheduled dams will decimate the fish population in the Lower Mekong Basin by half. The dams would also affect roughly 20 million Vietnamese people in the Mekong Delta, an area that accounts for more than a quarter of the country’s GDP. Dams block the flow of sediments, rich with nutrients needed to make soil suitable for cultivation. In Vietnam eroded riverbanks and houses tumbling in the water have become a common spectacle. The Cambodian prime minister Hun Sen dismissed these environmental concerns, criticising “radical environmentalists”. The international NGO Mother Nature mapped the environmental consequences of the Lower Sesan 2 dam. Consequently, the Cambodian government revoked its license. One of the founders, Alejandro Gonzalez-Davidson, has been banned from the country. The dams come at a high environmental cost, imperil food security and risk increasing poverty for millions of people. Moreover, the river’s potential is overestimated by dam developers, says the Mekong River Commission. Dams will meet just 8 percent of the Lower Mekong Basin’s projected power needs. The MRC proposes a ten-year moratorium on dam building. But few governments are listening. The MRC valued the combined fisheries for the Mekong Basin at 17 billion dollars. Energy from the 13 dams may yield 33.4 billion, according to an international study by Mae Fa Luang University in Chiang Rai. But a denuded river system carries a price tag of 66.2 billion dollars, the same study predicts. The real costs of hydropower seem to outweigh the benefits. But the projects still go ahead. The thump of jackhammers will become more common. The mother of all rivers will have to face an army of men with safety hats that want to stop her from flowing freely.